From I-75 (southbound), exit 200 (State Road 681); to US 41 South. Travel south on US 41, turn right onto Albee Road. At end of road, turn right onto Casey Key Road. The property is immediately on your left. From I-75 (northbound), exit 195 (Laurel Road); turn left and travel to US 41. Turn left onto US 41, turn right onto Albee Road. 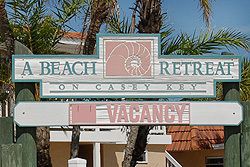 At end of road, turn right onto Casey Key Road. The property is immediately on your left. From the Gulf of Mexico, enter the Venice Inlet, sail north in the Intercoastal Waterway. 1/4 mile north of Albee draw bridge turn west and south again south to our docks.